The Greater Manchester Breast Screening Programme (GMBSP) is part of the National Breast Screening Programme (NHSBSP) and is one of the largest screening breast screening services in England. 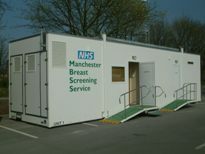 GMBSP provides a free breast screening service for well women aged between 50 and 70, resident in Greater Manchester. We aim to provide and promote an efficient and effective, high quality breast screening service, to all eligible women within a caring environment. Information about breast screening is also available in other languages. Please select your language from the list below to download the relevant guide. If you already have an appointment, but would like to change it, just complete the change your appointment form and we will rearrange it for you. We would also encourage you to contact us with your mobile telephone number. We use mobile numbers to send you reminders about your appointment or to alert you about any clinic cancellations. We invite around 65,000 women per year for screening. Screening is organised according to your GP practice. Once every three years your GP practice will be contacted and all women between the ages of 50 and 70 will be routinely invited. The Prevent Breast Cancer Prevention Appeal is the only charity in the UK dedicated to the prevention of breast cancer. The charity funds vital research into breast cancer prevention strategies and promotes breast screening and early diagnosis.